Women represent the largest growing segment of the golf population and Surrey Golf Club is mindful that in order for women to enjoy golf, programs need to be tailored to their specific needs. Surrey Golf Club provides Ladies Clubs’ geared to the keen and competitive golfer as well as more casual programs such as Monday Night Ladies Night on the Main Course. Runs from the first Monday in May to the last Monday in August. Play does not take place on any holiday Mondays. Cost is $40 between 3 and 4, $30 after 4 and includes green fee and prizes. Reserve your tee time 8 days in advance after 6 p.m. for the following Monday. Play commences the first week of March each year and spirited play coupled with good company each week characterizes the Thursday Ladies Club. 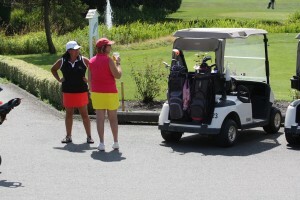 The Ladies Club plays Thursday from 8:30 – 11:00 a.m.
10% off green fees any time you play at Surrey Golf Club. 10% discounts off all menu items excluding specials or alcohol. Events are held each week to stimulate interest and friendly competition. The Club is limited to 100 women and there is presently a few openings. The Business Ladies Club is an association of ladies who look forward each weekend to camaraderie and friendly competition after a busy week at work. The Club consists of a good mix of low handicappers, mid handicappers and high handicappers who are relatively new to the game all whom share the same bond – they love golf! The Business Ladies Club plays Saturdays from 10:15 a.m. to 11:00a.m. 10% off all menu items excluding specials and alcohol. State of the art handicapping & tournament services (BCGA System). Events are scheduled weekly from March through October for the interest and enjoyment of the club members. WE ARE CURRENTLY ACCEPTING NEW MEMBERS IN OUR BUSINESS LADIES CLUB FOR 2017! For Great Savings on Golf and Dining, signup by clicking HERE! To check more reward items in detail, Please login by clicking HERE CAP Reward Club!